Haiku Poetry is the basis of much of my work including workshops with youth, training for mentors/teachers and my newest addition has been teaching as part of the Options for Living and Learning Program offered for inmates in the DeKalb County Jail (DeKalb County, GA). Haiku is an ancient form of Japanese poetry that uses 17 syllables to tell a big story with few words usually configured as 5 syllables on the first line, 7 on the second line and 5 on the third line. I named it Healthy Haiku to symbolize the organic flow between health and wellness, poetry and other creative arts. I started this work with children in 2006 and over time realized that adults can benefit from the same information and process – especially parents, teachers and mentors. Three publications and 11 years later, I find myself loving the work with the inmates – many of whom are parents and others that want to become parents and mentors. The time spent with them has me at my creative best, helping them to see the infinite possibilities for their lives created anew! The Healthy Haiku process guides them through lessons about nutrition, self-esteem, forgiveness, creations of vision boards and so much more. A typical lesson (not that any of them are typical per se!) starts with meditation, power cards, followed by the main lesson which always involves some type of creativity on their parts, and we close with evaluations and Namaste (the Divine in Me – Greets the Divine in You!). I am there to challenge them to “Step into their Power” to stop being mediocre (which it way overrated anyway) and to be about the business of being on their Divine soul journey. Enough with the distractions and playing small. Marianne Williamson reminded us in her famous poem Our Deepest Fear – that ” Your playing small doesn’t serve the world!” Sometimes they get mad at me and it is during those times that I know that I am pushing some buttons and taking them to the edge – heading to a breakthrough. It is uncomfortable there – and there is nowhere to hide and nowhere to go but up! Recently I asked them read a play that I co-created with my teen theater group (Y.E.S. 4 Health, Inc.) some years ago entitled Drive-Thru Justice. The play highlights health disparities regarding diabetes in the African-American and Hispanic communities. Some of them didn’t quite get the play which the youth loved. Based on science, facts, very dramatic – filled with humor and excitement. One woman said it was racist. Not – it was based on facts and was meant to educate primarily African-American and Hispanic audiences about diabetes – how you get it, how it is prevented and one community’s struggle to make a difference in health outcomes in their community by highlighting the negative consequences of fast food consumption. One woman who refused to read any of the characters for two weeks straight, was singing under her breath as we wrapped up the class. I told her that I forgot that she was a singer and asked if she knew “His Eye is on the Sparrow?” and if she would sing it next week in the funeral scene. Her face lit up with a smile as she proudly proclaimed that she knew it and would be happy to sing it next week! It’s so on!!!Yes! I accept the challenge of making this work relevant to their lives! To strive for a better life. Don’t do what I did! We will go home soon. They can’t hold me here forever. Life is not my Enemy. I am a Spiritual Being. I control my own destiny in Life. Love is the Greatest Power of All! Six boys and 1 girl are mine. But as one we all Survive! I’ll rise like dirty birds. Stepped up and took control. The road I took here. Through God who strengthens me. No limit on my Destiny! Had to fight my wrongs. Loved money, women and cars. My God and the stars! Dr. Imani Ma’at is a Health Educator and Behavioral Scientist, Author and Speaker with 22 years of service at the Centers For Disease Control and Prevention (CDC). Her education includes a Master in Education from Harvard and a Doctorate in Health Education from Teacher’s College of Columbia University. 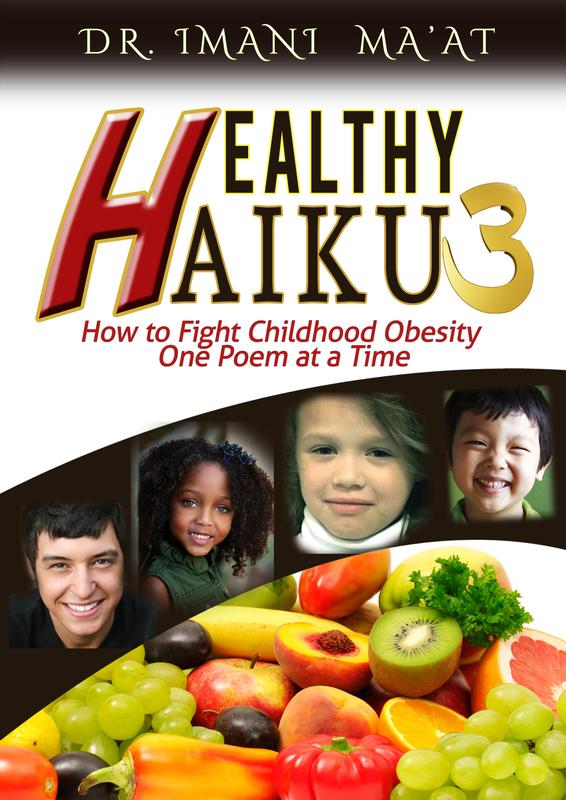 Her most recent book in the Healthy Haiku Series is Healthy Haiku 3: How to Fight Childhood Obesity One Poem at a Time. This book is a great resource for teachers, parents, mentors and others. It includes science, fun and creative strategies to address nutrition and lifestyle to prevent obesity in youth and all family members. For more information and to book her for speaking engagements and workshops please fill out the information below. Someone asked how the women’s class was today. Very nonchalantly I mouthed – It was good! No – it was “freakin” amazing. I have been teaching a Healthy Haiku Wellness Program for inmates as part of the Options for Living and Learning program offered by the Dekalb Sheriff’s Office. The majority of classes have been with women but I have had a couple of opportunities to teach males. The course pulls together and uses the best of my training and experience as a health educator, researcher, author, speaker and global humanitarian. Haiku is an ancient form of Japanese poetry that uses 17 syllables to tell a big story with few words. * We actually write poetry sometimes, however we incorporate lots of exercises and role-play that pushes them off into the great expanse and challenges them to redefine their reality and their futures. Always reinforced is the fact that jail time is temporary. Most of them are not hardened criminals heading to prison, although a few may be. The majority of my students have committed petty crimes and are in jail pre-hearing or pre-sentencing because they lack the resources for bail. One young woman looked up at me during a class. I honestly do not remember the particular topic. However she looked up at me and said she had been trying to figure out why she was in there [jail] because she had not done anything. She then said that she realized why she was there, because she was supposed to hear what I had to share. The next week she told me that she was going home as all charges were dropped. I was so happy learn that this bright, talented and very intelligent young lady was going back to the community with some new tools to orchestrate her life. My closest friends and family know that my class at the jail is perhaps the highlight of my week as I get to share and be creative from a space of caring and non-judgment. Due to the high turn over rate in the county facility, for many of my students I may have only one or two shots to make a difference in a way of thinking and being that will carry them forward in a more powerful and positive way. This week’s exercise after meditation and reading of inspirational cards, was an interviewing exercise that had the women paired up and interviewing each other about their passions, skills and abilities and opportunities for improvement in order to “Step into their Power.” A room full of inmates was transformed into conference suite with a Manager, a Professional Author and Speaker, A Comedienne, a Chef, a Hair Stylist, a Singer, a preschool educator and so much more. I challenged them to show us what they had. We heard some really funny unrehearsed comedy and one young lady sang a beautiful rendition of His Eye is on the Sparrow. The preschool teacher told us that she didn’t mind changing diapers and wiping runny noses and reiterated that teaching infants and toddlers was truly her passion! On other occasions we had a guest, Brigitte Keane who presented Laughter Yoga, which had the women laughing, clapping, crying (the kind of laughing so hard it makes you cry – cry) and having incredible healthy breathing fun. People in the facility were trying to figure out what in the world was going on that day! One of my repeat students who has unfortunately moved on to prison, smiled for the first time. I told her that it was nice to see her smile and I realized that her solemn look was due to missing upper front teeth. In this environment, no one judged – it was way too much fun! We have also done vision boards with power words to define their lives and futures, sessions on self-forgiveness, radical forgiveness of others, and Ho’oponopono. Ho’oponopono (ancient Hawaiian healing technique) which has each person take total responsibility for everyone and everything and uses a clearing technique that consists of 4 simple phrases said to ones-self: I love you; I’m sorry; Please forgive me; and Thank you! Since learning the Ho’opononpono (described in Joe Vitale’s book entitled Zero Limits, (2007) about the healing work of Dr. Hew Len of Hawaii in a mental health wing of a maximum security prison) the women have shared experiences where they used these phrases to resolve conflicts with family members during visits and with other inmates as well. Earlier classes covered topics such as nutrition, violence, smoking, drinking and drug use! This work, and the breakthroughs that occur feel like nothing short of magic. It is hard to explain. The repeat students enter the room with hands in prayer position on their chests greeting me with “Namaste” (The Divine in Me greets the Divine in You!) Wonder where they learned that?! I share everything that I know to be helpful in building them up and expanding their world beyond the confines of the temporary jail walls. The occasional tears that are shed usually reflect a release and love of self that had been buried – for serving time for their crimes and for being mad at themselves for making bad decisions and for getting caught up and arrested. Self -love is one of the common threads of each class as well as Stepping into Their Power (I formerly had a Blog Talk Radio show entitled Stepping into My Power). Perhaps my reason for writing this is not so much to revel in the success of my work at the jail as it is to reinforce the importance of loving yourself everyday in order to make healthy and right choices in all of your affairs. Life as we know it gets very complicated and downright scary sometimes. If we move from a place of love for self and understanding for others – because we are truly reflections of each other, we will see better outcomes and more people standing in their truth and in their power. But there’s too much smoke in between. It seems so far fetched maybe too extreme. Which seems beyond my fingertips. I still can’t seem to see. Which has always been within Me! Peace, Love and Blessings Y’all! Updates and Coming Events: I have an incredible deal for new Wellness Coaching Clients which includes Six Months of Free Coaching. Yes, you read that correctly! Send me an email for details to: imanimaat@gmail.com. 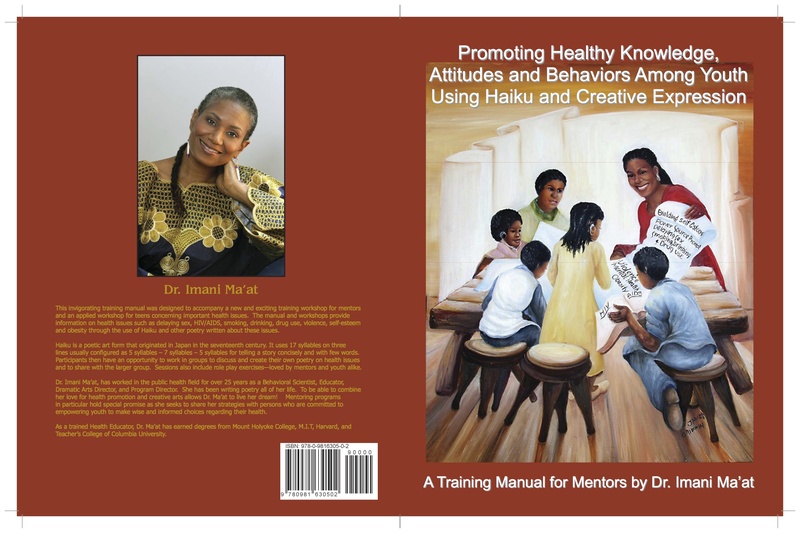 *Learn more about the Award-winning Health Haiku Poetry series of workshops and publications. I waited until after the second set of workshops before sharing on this Blog. My waiting pales in comparison with the waiting of these women. Most are very young – waiting: waiting in jail for their hearings, waiting to be united with their children, husbands, other family and friends. Some are awaiting sentencing. My goal is to help to build them up – mind, body and spirit – to help them to find their voices through discussions and poetry writing about health and wellness. Imagine women who can’t wait to start taking wheat-grass juice and alkaline water on a regular basis! Just eating healthy food on a daily basis is something to look forward to upon their release. I remind them that this “station” in life is temporary and that better life, better days filled by better mindsets, self-esteem and passion for making their lives better – is in their future! During the workshops we do individual and group exercises, brainstorming and writing. Each participant presents her original poetry to the group, once encouraged to stand straight, speak up, articulate and clearly enunciate. Communication skills are key to their effectiveness in negotiating a system that has very low expectations of them based on past interactions. Fueling their new skills and attitudes are Dr. Marianne Williamson’s “Our Deepest Fear (is not that we are inadequate, but that we are powerful beyond measure!”) and other positive words and works. I write this blog because they asked and because it becomes a link between them and the outside world. It is a way to share their words and their hearts. I feel breakthroughs! Some tears -which I remind them is part of the releasing and healing process – and lots of laughter. I celebrate their little steps. When they recite their poetry with the group, I introduce them as ” the Fabulous (and their name). I want for this Blog to be about them – not about me. Their poetry speaks volumes of who they are and of their potential! Just not going to be Defeated! Where did my love go? Let them know you care! Fall in love with who you are. Flopping wings seeking my dreams! God is within us, Never against us! I wish you could be near to guide me! He’s a ton but I am a proud mother! I know you would have loved him too. I even gave him your middle name, Michael! Some say I’m a daughter. And others say I’m a Child of God. But I tell you I’m all of the above! Why try to hurt me? That disrespectful tongue of yours. You would know, or would you? If you’re leaving with no plan? That we’re worth a second chance! This class was very pleasant. It made me step out of the negative…if only for a moment! I always enjoy this class. It lets me realize how much joy is in me! Are there children in your family or life that are overweight or obese? One in three children and teens is obese. This is an epidemic that is touching the lives of so many. Oftentimes obese and overweight children suffer with emotional and physical problems that go unaddressed. They are often the first to be bullied and the last to be chosen for the sports teams. They also are at-risk of having life-long obesity and other health challenges. 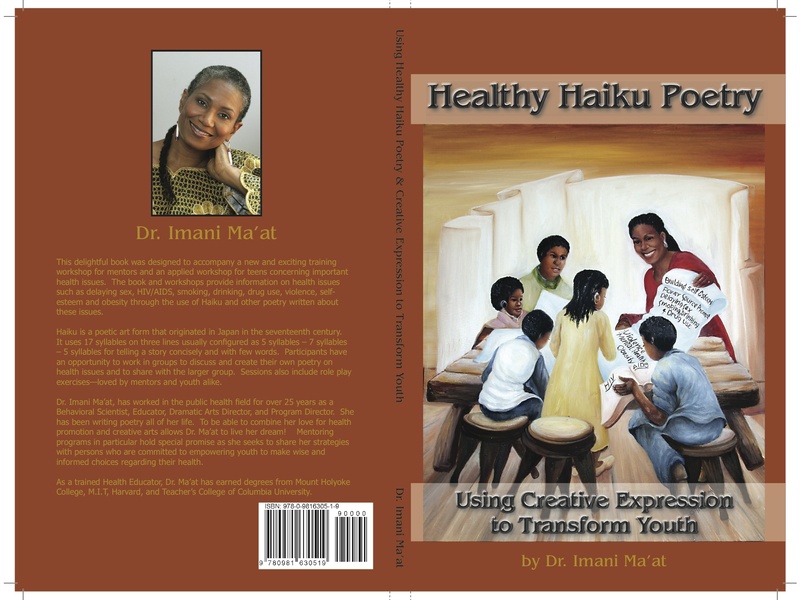 Dr. Imani helps to “Lighten Up” the situation with poetry and fun with the third book in her Award-winning Healthy Haiku Series entitled: Healthy Haiku 3: How to Fight Childhood Obesity One Poem at a Time! This book is filled with the science that parents, teachers and mentors want, and the fun activities and poetry that children like! For example the book includes role play activities that – once the lesson has been taught, the curriculum offers an opportunity to practice what they have learned in a fun way. Participants also have an opportunity to write and share their own poetry or prose about nutrition, exercise, and life’s challenges and accomplishments. The bottom line is Building Self-Esteem and Reinforcing Positive Behavior Change! Currently in Production – Order your Pre-Publication Ebook Copy at a Huge Discount Today! Price will go up at the end of the month once published! This is a great resource for Parents, Teachers and Mentors! Right on Time for the New School Year! Dr. Ma’at is and Health Scientist and Educator with over 30 years of experience who worked for the Centers for Disease Control and Prevention (CDC) for 22 years. She has 4 advanced degrees from Harvard, M.I.T., Columbia University and Mount Holyoke College. ALong with her team of experts. Dr. Ma’at is available for workshops for all school grades, churches, YMCAs, YWCA’s etc. Don’t wait! Book Now for the Fall Semester and the 2015-2016 Calendar Year! They travel around the Country and Globally! 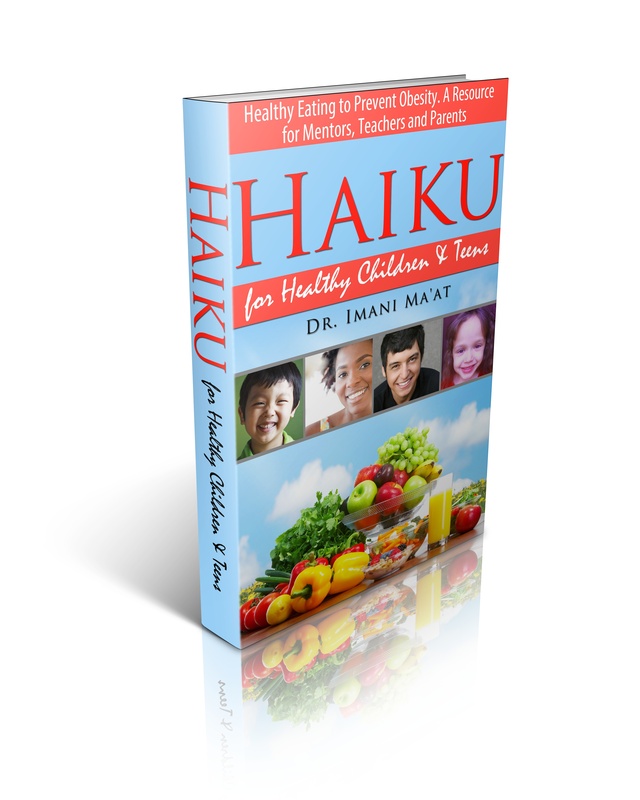 New Ebook Fuses Haiku and Public Health to Address Childhood Obesity! is dedicated to children and teens. Childhood obesity has been the subject of a major health campaign (Let’s Move!) by First Lady Michelle Obama. It has been a powerful and effective campaign in so many ways – for so many communities. However, even though it has gained a lot of visibility and support as a public health issue, obesity among children and teens is approaching epidemic proportions. Once again blending art and public health, this book is packed with scientifically sound information, poems and activities that can be used by families, teachers and mentors. Haiku for Healthy Children and Teens provides information and strategies for Mentors, teachers, parents and others concerned about the health of young people; and offers the spark to turn on the “health light” or “power source prompt” in youth who are brilliant by design – from birth. The Haiku and other poetry are meant to serve as platforms for discussion, dialogue and creativity leading ultimately to informed choices that reduce risks associated with unhealthy and uninformed dietary choices. If there are young people in your life that are important to you, you definitely want to share this book/workbook with them! Included are lots of activities and places to create your own poetry about food choices and nutrition! Coming Soon! Expected Release Date: March 1st! Please take our poll and let us know if you would like updates on this book, related programs and services as well as other books in the Healthy Haiku series! Thank you for your continued interest and support!